Oh. My. Gooey. Goodness. 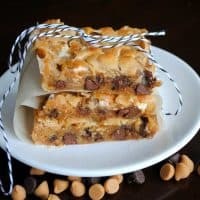 These bars are so sinfully delicious that you should NOT even bother making them unless you are okay with eating the whole pan by yourself. While watching re-runs of Mad Men. Drinking a giant glass of milk. All Mondays should involve dessert. Just sayin. Preheat oven to 350 degrees. Line a 13×9 baking dish with parchment paper. In small bowl, melt butterscotch chips with butter in microwave, at 30 second increments, stirring between each time. Set aside. In large mixing bowl, add brown sugar, eggs, and vanilla. Mix in melted butterscotch chips, flour, baking powder and salt. Fold in marshmallows and chocolate chips. Pour batter into baking dish. Bake for 18-22 minutes. Cool, cut into squares and refrigerate for one hour. Enjoy! Oh Good Lord! And I happen to have all the ingredients…. I love butterscotch, hugely! 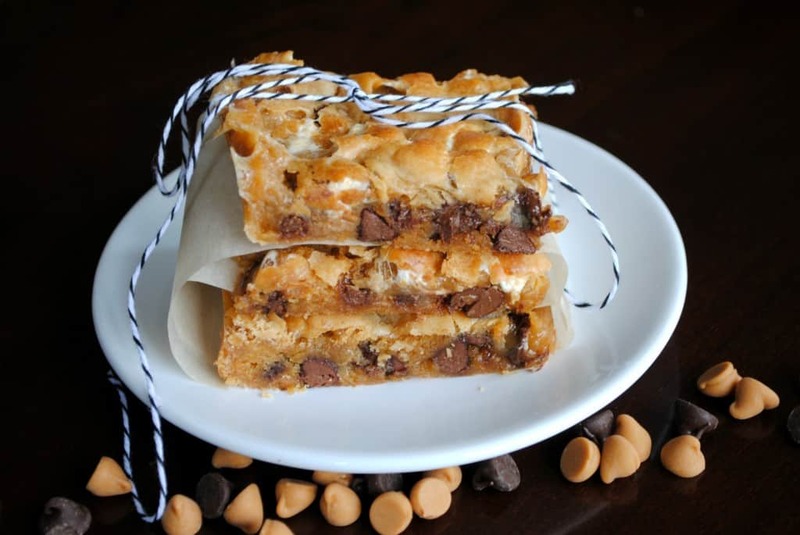 Just posted bars with them in it and with choc chips, AND I love marshmallows, too. Oh my goodness..I think my husband will die if he finds me growling at him while eatting a whole pan of these in p.j.’s, drinking a giant glass of milk! I am so going to have to do this! Have a fantastic week! They are gooey and delicious and you’re right, highly addictive! Btw, your picture is perfect!!! I agree; all Mondays should involve dessert! These bars look absolutely perfect! Oh my sugar coma. Those do look fantastic. I don’t even like chocolate, but I think I could put away the tray. Wow. these look so good!! i love how ooey and gooey the filling is with the marshmallows..yum! These bars look absolutely AMAZING!!!!! YUM!!! What a great recipe, thanks for sharing these!!!! These are dangerous because I think I have everything to make them already. I am totally ok with eating the whole pan myself and thats what I plan on doing this weekend!! Oh my sweetness! These look beautiful and delicious…Thanks so much for sharing at Mix it up Monday! These look AMAZING!! 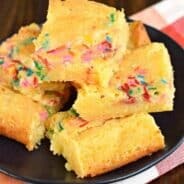 Pinned the recipe to definitely try later! Oh my gosh! These look like the best things I have ever seen. I am seriously drooling. New to your blog- I searched “butterscotch” in my google reader and saw your recipe from Tatertots and Jello and made them for company tonight. They were a hit! Thanks for the great recipe! OH MY GOODNESS!!! These look ABSOLUTELY FABULOUS! I definitely have to make these, and I am definitely going to pin them! YUM! Hopping by and following your FB, G+, pinterest, stumbleupon, and twitter. Any ideas if I can sub Marshmallow Creme for the mini marshmallows as that’s all I have at hand? I haven’t tried it, but you can certainly try. I wouldn’t use the same amount as marshmallow though, maybe half? So 1 cup? WOrse case scenario is even gooey’er. Not a bad thing. Girl, you have done it again! 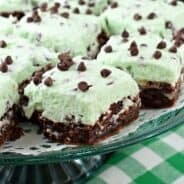 I was really wanting to bake something and found this wonderful recipe! I have all the ingredients and it’s in the oven now! My hubby is sooo excited he loves butterscotch! Eat the whole pan…are we twins?! I’m making this the next time my kids are gone for the whole day. You could try peanut butter morsels! I have made these 3 times in the last two weeks, they usually last 1 day and there are only 3 of us. I have found using self rising flour creates the best outcome. It’s the only flour I had the first time so I took a chance and they come out so much better then with flour and baking powder., consistency wise. Delicious. 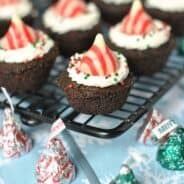 I just made these for my kids and, yum! I’m just curious if they need to be refrigerated safety or is that just a cold vs. room temp preferance? I noticed the last step is refrigerate for 1 hour. I found leaving them out turned them even gooier (is that a word??). You can totally leave them out safety wise 🙂 glad you enjoyed them! Just made these and they are great! SO sweet, though, so everyone be warned! In fact, you should probably list milk as a required ingredient because you’re gonna need some after you’ve had a bite or two! Thanks for the yummy recipe!